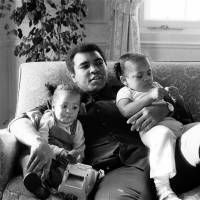 At the time of the wide-ranging phone interview, Ali was 73 years old, and the 85-year-old Izenberg was remembering their unique friendship that spanned many decades. But before Ali’s death at age 74 on Friday, the iconic boxer and the legendary sports columnist hadn’t been in close contact in recent years. “The last time I spoke to Ali was about four years ago, when we could still communicate,” Izenberg said in September 2015 by phone from his home near Las Vegas. “But I’ll tell you, we had a great relationship,” he added. What defined their relationship? I asked the 15-time Pulitzer Prize-nominated writer. “I think the fact that, No. 1, he understood that I understood more about Islam than most writers,” Izenberg, the longtime Newark Star-Ledger sports columnist said. “And also about the Nation of Islam. . . . And I saw the metamorphosis in Ali . . .
“This is a guy who, until he lost his marbles, was . . . a devout Sunni Muslim. And I saw the transition from one thing to the other,” Izenberg said. Izenberg pointed out that the legendary boxer liked “familiar things and my face was always there. 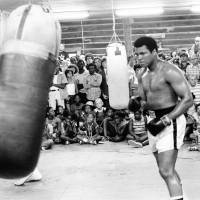 On a PBS documentary, “The Trials of Muhammad Ali,” released in 2014, Izenberg was asked to give his perspective on the former heavyweight champion. Their friendship was easygoing and was buoyed by talk — about practically anything. “He would ask my opinion about things that he was really interested in,” recalled Izenberg, who has covered all 50 Super Bowls and went to his 50th Kentucky Derby last month as a journalist. There, in Deer Lake, Pennsylvania, Izenberg and Lisker walked in on a training session. “I found out later how they healed his hand, and again I found that out from the guy who set it up and nobody else ever wrote it or knew it, and I don’t even know if they knew he had bad hands because with (Dr. Ferdie) Pacheco always giving him shots and Novocaine, crap, and they were saying that this doctor took him off all that and did something else. Izenberg, of course, will never forget that. Before the turn of the century, ESPN selected Michael Jordan as the greatest athlete of the 1900s. Babe Ruth was picked second, and Ali was chosen No. 3. “He (MJ) only impacted on the shoe industry,” Izenberg commented, “and kids who are idolizing the fact that they are going to get the kind of shoes that he had. A great player? One of the greatest who ever lived. But the impact on the era was Ali. Talk about a fly in the ointment for a columnist on deadline. Fast forward to the Opening Ceremony. “So I look up and I see him and he’s doing it,” Izenberg said, “and I’m so f—- mad, because now I’ve got to work. I could’ve had an easy night, right? “And I said, ‘Who is this?’ I know who it was, of course. “Well, Kim said you were in the hospital,” Izenberg replied. Ali informed his friend he didn’t know where he was. So his wife, Lonnie, got on the phone. She told Izenberg to stop by the Omni Hotel. He arrived at the hotel. A while later, the two old friends were alone. Ali lay down on the bed to rest and they began talking. “Now,” Izenberg said, “you can still understand him but you’ve got to a) know who he is; and b) if you know him, get accustomed to his voice. It always takes you a while to readjust. And he’s going to say about five words, and you are going to have to translate that into a full paragraph. “And he’s talking to me and he’s talking about the closet, and I think he’s saying someone’s in the closet. I didn’t know what the hell he sees, and he’s mumbling, so I go and open it up. In the closet is the Olympic torch. “I bring it back and I hand it to him. He looks at me and he puts it in my hands because he thinks he’s doing a great thing . . . because he thinks it’s a great thing for me to hold the torch. So I thanked him and I handed the torch back and put it back in the closet. Indeed, the special bond between Izenberg and Ali extended beyond their jobs. It was truly unique. “I’ll tell you how close our relationship was,” Izenberg said without hesitation. And his razor-sharp memory set the stage for a series of unforgettable moments that go beyond the typical encounters between journalists and pro athletes. 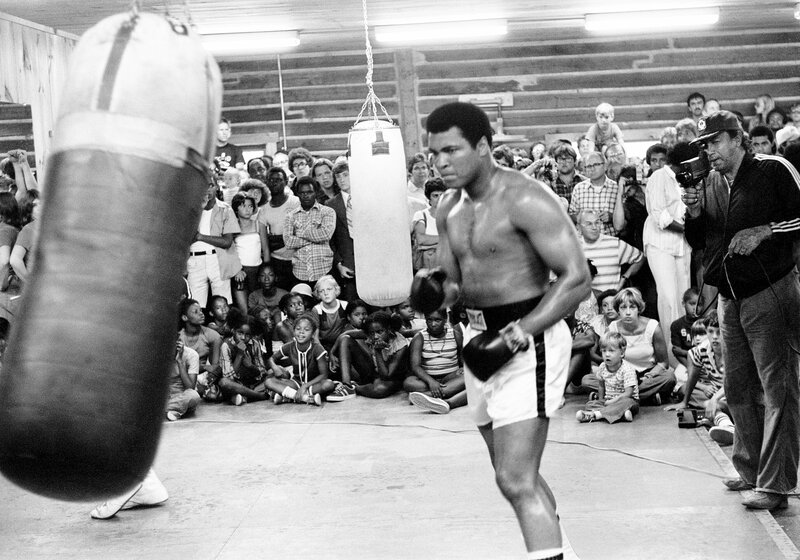 He’s doing work in preparation for Ali’s fight in Kinshasa, Zaire, against then-world heavyweight champion George Foreman — The Rumble in the Jungle, Oct. 30, 1974. While children, Robert, 11, and Jenny, 8, had just come to live with him two days prior, his parental instincts were put to the test. “I’m driving to Deer Lake (Pennsylvania), and I’ve got my daughter and my son in the car,” recalled Izenberg. 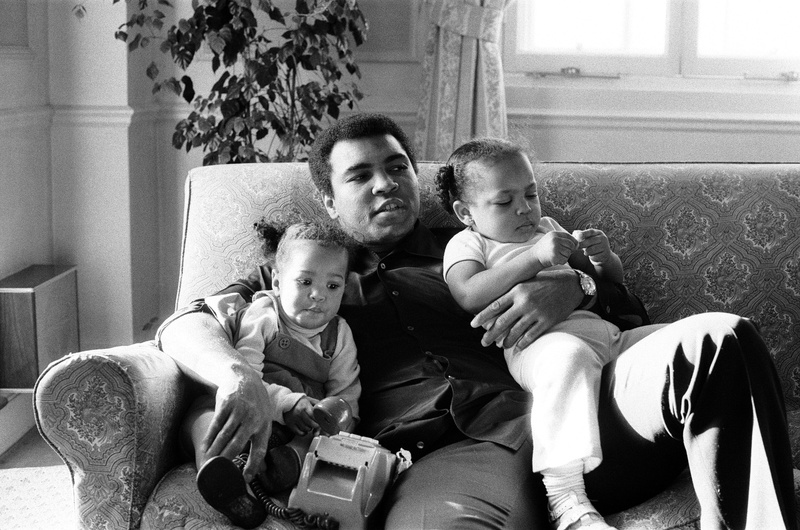 At any rate, en route to Deer Lake, Izenberg was confronted with figuring out how to keep his children occupied while he is covering Ali’s training camp. 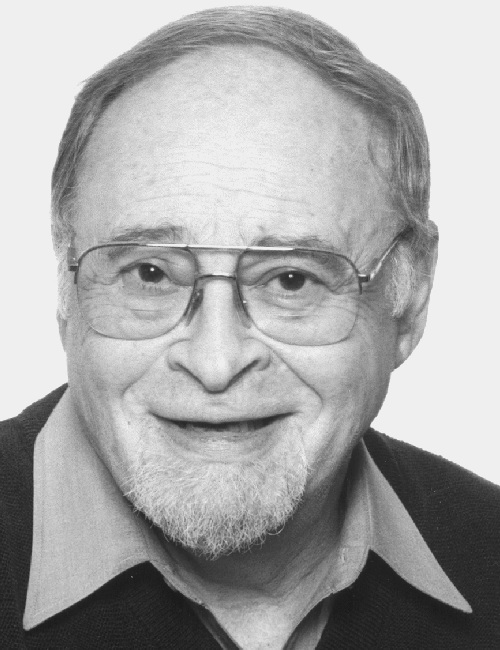 “His (daughter) says, ‘What am I gonna do?’ ” Izenberg recalled. His orders? “Well, you go to Aunt Coretta (Ali’s aunt) and tell her that you are the official water girl of the Jerry Izenberg television crew and she’ll give you a couple of bottles of water and you follow them around with, but you keep your mouth shut. That set the stage for the TV cameras to start rolling. Ali asked Izenberg what his son’s name was, then walked over to him. “He put his arm around Robert and says, ‘Robert, I want to tell you something. You have come to live with a great man who loves you. 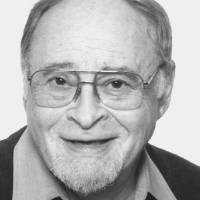 Learn from him.’ And he gets up and walks away,” Izenberg remembered. “So is this your daughter here?” The Greatest inquired in a quiet tone. “When you’re 7 years old, 8 years old, tell me what you think we’re talking about. She thinks I’m ratting her out about what she said about him,” Izenberg pointed out. Izenberg’s daughter walked over to them slowly, and then . . . The conversation shifted back to Ali. “Is that your daddy?” he asked her. As they’re driving home in Izenberg’s car, boxing talk between him and his daughter resumed.